Sophisticated and sturdy, the bezel setting is the MVP of engagement rings. You might be considering one because you like the aesthetic, or you might have discovered the bezel setting because of its functionality. In either case, it's a beautiful style that's worth getting to know. In a full bezel setting, a center stone is set flush within a thin metal rim. Metal completely surrounds the stone, creating a secure hold. With a partial bezel setting, the center diamond is only partly covered on the sides by metal. This makes more of the stone visible. Bezel settings have a big advantage: security. The bezel setting is an excellent option for those who have active jobs or lifestyles and whose hands see a lot of contact during the day, raising the risk that a stone could be dislodged. For example, doctors, nurses and athletes often shop for hardier engagement ring settings. (Check out our beautiful selection of Engagement Rings for Doctors here.) In a bezel setting, the diamond is largely enclosed and firmly secured to the band, decreasing the chance it will be loosened or lost (or damaged). Another benefit of bezel settings is that they easily hide inclusions in the sides of the diamond. This could enable you to save money on the stone — allowing you to prioritize a pricier band, or a bigger reception, or any of the thousand other bills you're dealing with right now — or to choose a slightly lower-grade stone that is larger than your budget would otherwise allow. The bezel setting also has a unique look. Cool and sleek, it's also somewhat retro, so if your partner is a fan of vintage styles like Art Deco or Victorian, it could be a perfect match. Typically, bezel settings are seen with princess or round-cut diamonds, but your options are wide. The style is truly versatile and can read as modern or vintage, depending on the specific design. Because the sides of the stone are enclosed in metal, a bezel setting will block the light, causing the diamond to sparkle less than it would in other settings. We don’t want you to overestimate this effect, though. As long as you get a stone with an excellent cut, your stone will still sparkle. It will simply be a little less since there are fewer points where light can enter the stone and get bounced around. The bezel setting can also make the diamond look a little smaller (but you and your partner will know the truth!). It could also be more expensive than prong settings, owing to the larger amount of metal used in the band. Bezel settings aren't just seen on the center stone. Accent diamonds can also be showcased in a bezel setting, allowing for some truly distinctive ring designs. It's a terrific option to increase sparkle in a secure setting, or simply because you like the look: Check out our Under Bezeled Engagement Ring or Diamond Leaf Engagement Ring for two examples of this distinctive style. One consideration to keep in mind with bezel settings is maintenance: Dirt can get between the metal and your diamond, or under the bezel setting, which can be hard to clean. 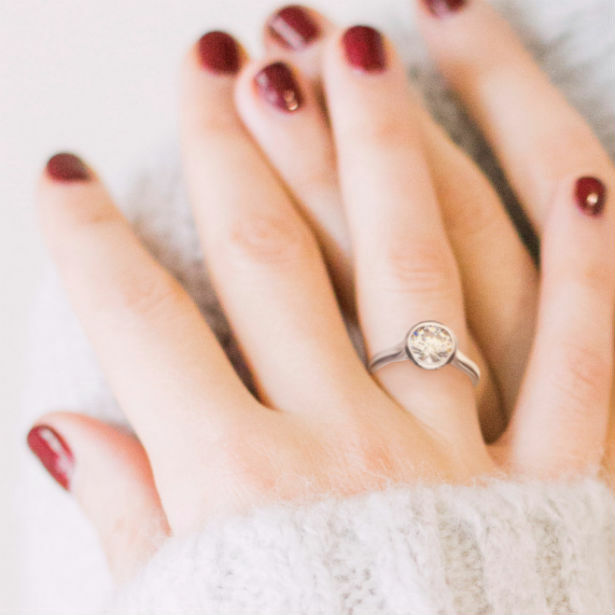 You can clean your ring in warm, soapy water (gentle soap) and can use a soft-bristled toothbrush to help, or opt for a periodic professional cleaning to keep your ring beautiful through the years.